Get up to 3x more retirement savings*! As part of our Better365 initiative, we are partnering with the Employee’s Provident Fund (EPF) to help our driver-partners save for retirement! 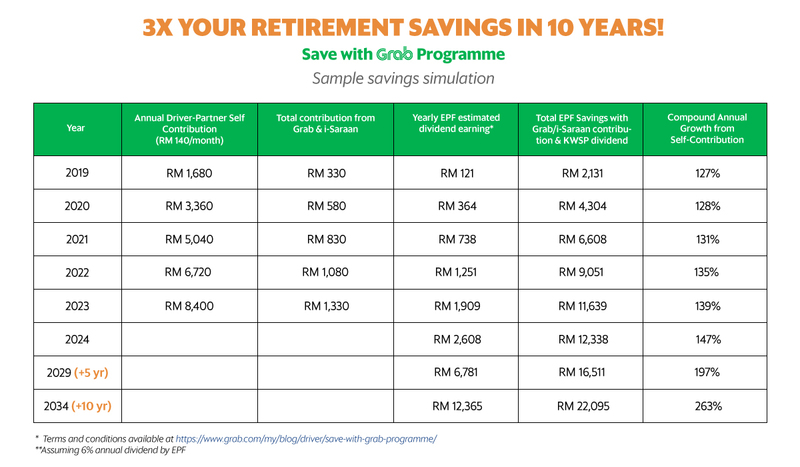 Effective 16 August 2018, we’re introducing the Save with Grab Programme, exclusively for Gold and Platinum self-employed driver-partners who want to contribute to EPF via i-Saraan. Save with Grab Programme entitles driver-partners to receive an additional 5% contribution from Grab by actively maintaining a Gold or Platinum status on GrabAllStars! Grab 5% contribution is subject to driver-partners’ Gold/ Platinum GrabAllStar status for the period of 4 out of 6 months. Grab 5% contribution will be topped up in January & July while Government 15% contribution will be topped up in March & September. 15% Government and 5% Grab contribution are only applicable to drivers below aged 55 years old. Top-up is done at the end of every 6-month period per cycle. (January – June & July – December). Recommended contribution to achieve RM330 after 2 cycles is RM1,680. How much retirement savings can I get in 10 years? Ensure that you have registered for i-Saraan at any EPF offices. Log into your account at GrabAllStars.com. Opt into “Save with Grab” Programme Voucher. Fill in EPF number. Agree to Terms & Conditions and click Submit. How do I qualify for Grab’s 5% Contribution. Voluntarily contribute into your EPF account under i-Saraan. Driver-Partner who do not qualify for 15% government contribution will not be entitled for 5% contribution from Grab. I have not registered for i-Saraan, what will I need to do ? You may visit any EPF offices nationwide to register. After you have registered, you may start contributing voluntarily into your EPF account via i-Saraan. How long is one cycle? One cycle will last for 6 months (January – June & July – December). However, as this will be the first cycle, it will start from August – December 2018 and driver-partners will have to maintain Gold or Platinum GrabAllStars status for 4 out of 5 months instead. When is the latest date to opt-in to the programme? Driver-partners need to opt-in before 30th September 2018. When will the full sum of RM330* contribution be topped up into my EPF account? The RM330 contribution will be topped up into your EPF account within 3 months after end of Cycle 1 and Cycle 2. I have been contributing to EPF-i-Saraan. Am I still entitled to the 5% contribution from Grab? Driver-Partners will still need to achieve Gold/Platinum status on GrabAllStars to be eligible for the 5% contribution from Grab. You will also need to provide your valid EPF number on GrabAllStars.com. Can I still register for i-Saraan if I have a monthly contribution from my employer? i-Saraan is a programme for all Malaysians as long as they fit the criteria. 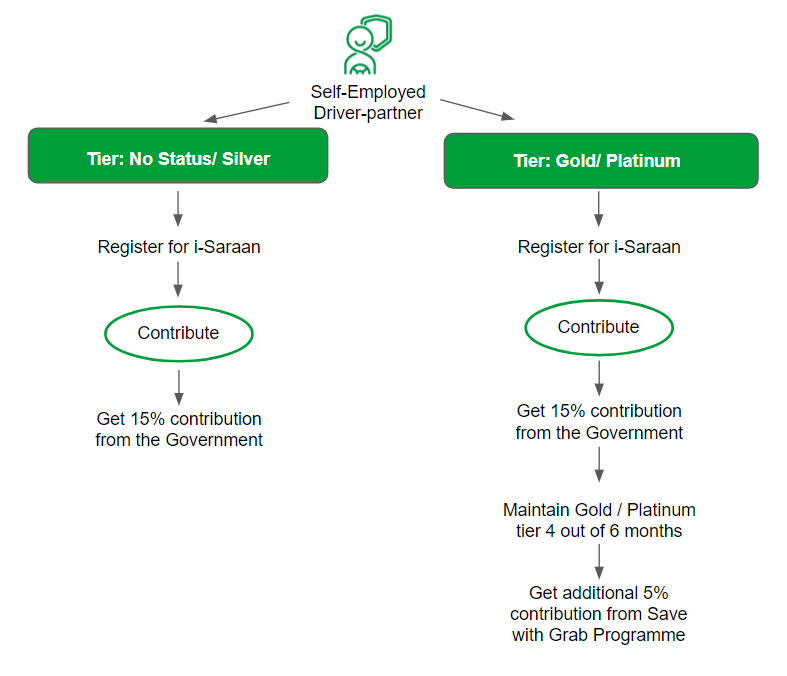 Driver-partners can still contribute to i-Saraan voluntarily but will not receive government 15% contribution or 5% contribution from Grab. Is there an age limit for this programme? The Save with Grab Programme is open to all self-employed driver-partners that are under the age of 55.